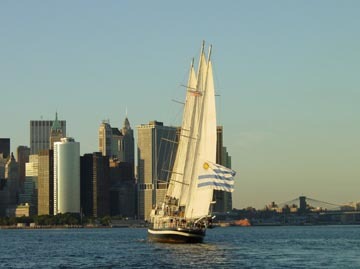 The first time we sailed to Manhattan , we did so to join the thousands of boats taking part in Sail for America . 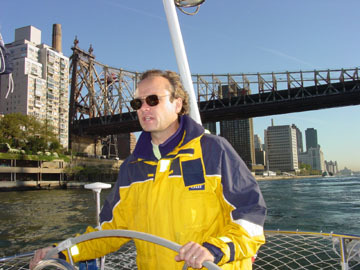 We’d always had trepidation about THE EAST RIVER having heard horror stories about HELL GATE. Heck, there are currents in excess of 7 knots and 7 knots is our hull speed! This time we were going no matter what, and we went a day early to meet the sailors competing in the Around Alone race, one of whom was our friend, Tim Kent. So we studied and prepared. We charted our course and plotted the tides and currents. We prepared, checked and cross checked. Finally, it was time to go and we left at sunrise to catch the tide running down the East River . 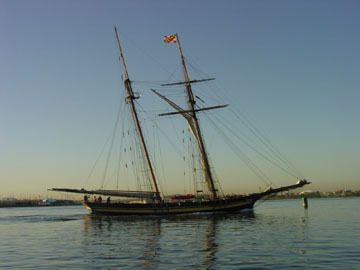 Surprisingly, we met up with The Pride of Baltimore entering the river and transited just behind her the whole way. It was great because (a) we confirmed that we had calculated the timing right and (b) it gave a chance to watch what she did and see how the currents treated her. It helped us prepare for the tricky parts when we saw her being swept sideways in a channel. I had been watching the river each time I was stuck in traffic on the FDR Drive and had memorized places that looked hairy. But from the water now, it looked nothing like it did from the land. As our speed climbed with the building current on our East River sleighride, we yelped like children topping 13 knots at one point. We had been overwhelmed by the sea of humanity as we passed La Guardia airport and the prison barges at Rikers Island . Then, the vista opened on Manhattan at sunrise and I don’t think either one of us had been prepared for this. The light gleaming off the glass and steel, the traffic along the East River Drive like a giant snake, and tiny specks of people running through their morning routine. It was mesmerizing. We even forgot about the current and just stared agape at the sights like country folk. The river was well marked, yet the traffic was building with barges and ferries and all manner of boats making their way in their window of tidal opportunity. 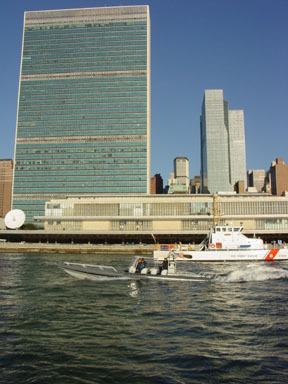 Suddenly, we were pressed shorewise by a giant tanker right at the UN building; out of nowhere shot a black RIB with men dressed in black clothes head to toe holding flat black machine guns pointed at us telling us to stand back. We motioned that we couldn’t, but they just came at us at high speed. Alex started waving feverishly at the giant tanker next to us, and then they realized we had nowhere to go. We all had a good laugh as they escorted us past UN territory, but we still think back on those few very tense moments. We had a great weekend, partying with the Around Alone sailors at the Intrepid, sailing in the amazing Sail for America, and gorging ourselves in little Italy at the feast of St Gennaro (or Saint Geronimo as one of our friends kept misnaming it). The return trip proved much less intense in drizzly miserable weather. That is until the sailboat in front of us failed to notice that the bridge closed just as they were approaching and we heard the tender yelling on the radio “They’re going to hit, Jesus, they’re going to hit.” We quickly sounded our horn with repeated long blasts and they reacted just in time to turn the vessel, heel under, and watch their mast bounce sideways under the bridge like a stick dragged along a picket fence. To our complete amazement, they never stopped, never slowed down to assess the damage, and just partied on up the river. Our next visit was another story, and totally different. We poked into Sandy Hook one early July to wait for the tide on a delivery from Chesapeake Bay to LIS. When it came time, the engine wouldn’t start. So we had to fix the engine and missed the tide. We decided to transit the river on the next tide at dusk, knowing full well that we wouldn’t make it all the way before dark. We would, however, be past Hell Gate well before nightfall and the rest should be a piece of cake. Once again, we were rewarded with an amazing experience…the sun setting behind the Statue of Liberty, sailboats gliding along everywhere, golden glow along the Manhattan skyline at the Battery…all visions indelibly etched in my memory. A tall ship from Uruguay led the way as the lights of the city started coming alive with the enveloping darkness. The traffic sitting at a standstill on the highway held carloads of people watching us and wondering who we were and where we were going. It was another magical experience. The river was well lit and easy to follow at night. In fact, with all the light from the city, it was just like walking down a city street, albeit a bit wetter. It was considerably darker out on Long Island Sound, but these are waters we know well. We reached our mooring precisely at midnight on a moonlit night. Such a magical experience is waiting for you. Do NOT attempt this trip without adequate charts, tide and current tables, and a VHF radio that works. You’ll need to listen to USCG reports on channel 16 and you may want to call the Coast Guard in advance to check for any scheduled closings. If dignitaries are in town or fireworks are planned, expect severe restrictions on traffic. You’ll need to talk to the bridge tender, too. The most important thing is to time your passage precisely or you’ll find yourself at best standing still at full throttle in a 7 knot current. Not a safe place to be. Click here for a three day tour itinerary. Click here for a guide to the working waterfront. Click here to visit goingcoastal.org and learning about the guides available. Click here to view a Going Coastal kayaker's map of the waterfront.